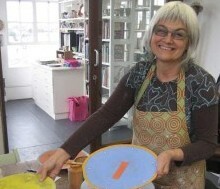 Clementina van der Walt is a well-known South African studio potter, based in Cape Town, who has in the past four decades lectured, run a production studio and held many one-person shows. Her work is represented in several international and South African national collections. She has participated in major shows abroad including eight consecutive years at Ceramic Art London. In October 2018, the Leach Pottery was delighted to present its first exhibition of Clementina van der Walt’s pots; celebrating the completion of a three-week residency, the exhibition featured pots made during her residency and also in South Africa. The Leach Pottery works mark a change in stylistic and material approaches as Clementina introduces more colour to her pots, taking inspiration from the St Ives Artist Colony to make a small collection of painterly earthenware domestic and decorative pots. They are now available to buy online. The South African pots respond to their local environment taking inspiration from the Japanese concept of wabi-sabi and its ideas of irregularity, imperfection, and transience. The pots are utilitarian earthenware, decorated using layered glazes and gold lustre.Her signature work, which includes utilitarian, decorative and sculptural, explores the use of colour and patterns inspired by South African urban and rural landscapes.